Life Stages Single Door and iCrate? : A side-by-side comparison. Double Door iCrate vs. Life Stages? : This table is very useful for those that like to see the numbers. Need a replacement pan? : Follow these directions if you are not sure which one you need. Championship Collection Replacement Pans: We have Replacement Pans for the Midwest Championship Series. Can I Join Together Two Exercise Pens? : You can, and here is some more information about how to do it. What About Heavy Duty Dog Crates? : They are available, but maybe you should look at the reasons before purchasing. Two Dogs in One Crate? : It can be done, but we do advise caution, and maybe you should consider a three door model. Great Dane Dog Crates: Yes, we have crates available for your giant breed dog. We Have Pans for the 89Z: The trick is to measure before you buy. Save Money with the Free Divider Panel: How does it prevent you from buying multiple crates? iCrate or Life Stages Dog Crate? : What is the difference between these two dog crate models? Dog Crates Made in USA: Yes, really! These are extra sturdy folding crates made in Indiana. You Have a Bunch of 48" Dog Crates! : So ... what's the difference? Solutions 54" Ginormus Double Door Dog Crate: At last a giant dog crate with a side door! Canine Camper vs. Day Tripper: What is the difference between these two soft crates? Announcing: MuttFence.com: Wireless, electric and underground dog fences and receiver collars by PetSafe and Innotek. Midwest K9 Kennels: Chain Link Dog Kennels: Safe, secure outdoor containment. Select 1300TD: The Crate With Removable Doors: Removable doors? What's that about? Midwest iCrates: What is an iCrate? Product Updates: Canine Campers, Day Trippers, Vehicle Barriers. Life Stages, DD and UL: The differences between the different Midwest Life Stages models. Midwest Dog Crate Pans: About the ABS plastic pan in your crate. Three Door Dog Crates: The most veratile of dog crates. RSS Feed: Subscribe to the Blog. Information about upcoming changes to the site, shipping and product availability. What we're reading in the news about dogs. If you have any comments on our blog or suggestions for topics to cover, please contact us. We love to hear from our customers. Midwest Homes for Pets quality testing. Midwest's dog crates have long been recognized for their high quality. This is why they are so popular among breeders and show dog owners. Here is a great article from the Humane Society on the benefits of crate training. Many of our Midwest dog crates include a divider panel so you can restrict your puppy's living space, but increase the space as she grows. This way you don't need to purchase a new crate every time she outgrows her space. Buy a Midwest dog crate for the size you expect her to achieve in adulthood. Give us a call and we'll help you determine the proper size Midwest puppy crate for your puppy based on breed. Or click here to go to our Crate Size page. How Do the Life Stages Single Door Crate and iCrate Compare? We wrote two previous entries about the differences between the iCrate and Life Stages crates and the iCrate and Life Stages Double Door crates. You may want to check out those articles also. This article completes the series goes into more detail about the differences between the single door versions of the iCrate and Life Stages crates. In short, model for model, although they are designed for similar situations, the Life Stages crates are heavier than the comparable iCrate and they feel more substantial when compared side-by-side. And now for the numbers. The table below lists each of the double door models available and provides some significant statistics. The crates are listed side-by-side for models starting at 22". The iCrate Double Door and the Life Stages Double Door Seem Similar - What's the Difference? We wrote a previous entry about the differences between the iCrate and Life Stages crates and you may want to check out that article first. This article goes into more detail about the differences between the double door versions of the iCrate and Life Stages crates. Our opinion is that the Life Stages crate is a tougher and more durable product, and that the differences are significant beyond how they appear on paper. For example, the wire pieces that hold the crate together (they clip over the top and sides at the front and back) are much longer on the Life Stages crate. Our experience is that this makes it much harder for a dog to exploit the folding mechanism and escape from the crate. If you think your dog may be a bit of a Houdini, we recommend the Life Stages model. I Need a Replacement Pan for my Midwest Crate, but How Do I Identify It? Most likely this question is being asked because you are not sure which model crate you have. This is OK, since we should be able to identify the correct pan from finding out a few things about your crate. Crate Style: There are two basic types of crate style. Folding Crates: These crates fold down without tools and without any disassembly. The panels are all joined together and the crate can be folded, but the panels can not be separated. Drop Pin Crates: These crates do not fold down, but can be disassembled. They have long pins in the corner (called drop pins) that secure the panels together. In order to disassemble the crates, you must remove the pins and all the panels separate and come apart. Outside Crate Dimensions: Obtain these measurements with your crate assembled and we need the outside measurements - imagine a box that fits over your crate. Crate Length: This is the longest horizontal dimension. Crate Width: This is the shorter of the horizontal measurements. Crate Height: In a few cases, this is the only way to tell two different crates apart. I Have the Information, What's Next? Folding Crates: Select Pan by Folding Crate Size. Note that there are special types of folding crates called “SUV Crates”. Drop Pin Crates: Select Pan by Drop Pin Crate Size. Note that there is a special category of drop pin crates called “Giant Crates”. Can I Get a Replacement Pan for my Midwest Championship Collection 500, 600, or 700 Series? The Midwest Championship Collection were folding dog crates available in a range of finishes and sizes. There are three basic series that were available: 500 Series Gold Finish, the 600 Series Bright Zinc Finish, and the 700 Series Black Electro-Coat Finish. The crates were available in sizes for dogs 11 - 110 lbs. The table below lists the Midwest Championship Collection Models, Dimensions and the Compatible Replacement Tray. Clicking on the pan link will take you to the correct product. Can I Join Together More Than One Exercise Pen? Midwest Exercise Pens are a great solution for containing your pet. They each have eight panels, each panel is 24" wide, making the panel sixteen (16) linear feet. The panels are attached together using clips that function as hinges, allowing the panels to be folded back and forth into almost any shape you desire. The pen is open ended, which means that you can stretch it out for the full sixteen (16) feet. This makes the pen very flexible because you can deploy it into a number of shapes, and it allows you to clip two pens together. How Do the Pens Attach Together? Each of the Exercise Pens comes with four (4) slide clips that allow you to close the pen. Using these clips, you simply clip together as many pens as you need. Midwest Pens are available in three styles: Gold Zinc with Door, Black Electro Coat With Door, and Black Electro Coat Without Door. Each pen has eight 24"W panels and the pens vary in height by model from 24"H to 48"H.
This is a subject that comes up a lot. In many cases, a requirement for a heavy duty crate is due to behavioral, or owner issues rather than a problem with the crate. Dogs that are well socialized, exercised, and not kept in the crate for too long will, in general, be better behaved. You may want to consider these issues prior to purchasing a heavy duty crate. The crates we sell are fit for purpose, but they are not indestructible and are intended to supplement a good crate and dog training regimen rather than fix a particular behavior problem. There are still many reasons for you consider a heavy duty crate. Some dogs can become alarmed by a knock at the door, a thunderclap, or from another unexpected stimulation. Rescue dogs can carry trauma and require special handling. The heaviest duty crate we currently carry is the Midwest Ultima Pro Heavy Duty Triple Door Folding Dog Crate. The Ultima Pro is manufactured from heavier gauge wire equivalent to some of the older Midwest drop pin crate models. In addition, the spacing on the wire is closer together than on most of the other crates. It also features three doors, removable without tools, a divider panel, black ABS plastic pan, a crate training DVD, and fold and carry convenience. To compare the Ultima Pro against the most commonly sold product - the iCrate Folding Dog Crates - the Ultima Pro is (in general) 50% heavier and the wire spacing is approximately 30% closer together. Both of these measurements contribute to the overall strength of the crate along with the heavier wire gauge. As usual, the Ultima Pro is available in a number of different models from the 724UP for dogs 11 -25lbs to the 748UP for dogs 91 - 110lbs. To view the Midwest Ultima Pro product, and to purchase one, just click on the link below. Can I Put Two Dogs in One Crate? This question gets asked a lot, and the specific question and answer is below. The short answer is that you can put two dogs in one crate, but with extreme caution, and we do not recommend it in most cases. The question and answer is specific to that person's circumstance, but you can adapt it for your situation. If you have any questions, contact us. I have two Shichon puppies, 14 and 18lbs, will a 36inch crate be big enough for them, they like to be together, or should I get a 42? 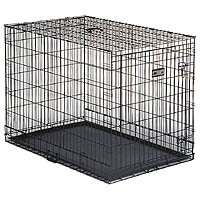 If you were buying a separate crate for dogs this size, we would recommend a 24 inch model which would be around 24"L x 18"W. A 36" Life Stages Double Door LS-1636DD crate is exactly twice this size at 36"L x 24"W, so there should be enough room for both dogs. Whether you want to step up to a 42" crate really depends on your preference. For ease of use, the two door versions are normally better. The side door allows the dogs to enter the crate and turn to the left and right. One note of caution when housing two dogs in the same crate: problems can sometimes occur - conflicts over resources such as food, water, or toys, or possibly over dominance. If you have any concerns about this (and we do advise caution) it may be worth getting a three door Select 1336TD,or Ultima Pro 736UP. The advantage of the three door crate is this: if it becomes necessary to separate the dogs when crating them, the two end doors, combined with the divider panel allows you to split the crate into two. Otherwise, if you run into difficulties crating them together you would need to purchase two more crates. Great Danes are great dogs and very popular. With sufficient daily exercise, they make surprisingly good indoor dogs, being relatively inactive when inside. Obviously Great Dane owners have the same containment concerns as other pet owners, needing a safe secure place to keep their Dane contained when they are not around to supervise him/her. Fortunately, we have a couple of models that are specifically designed for Great Danes and other Giant Breed Dogs that are usually 110lbs plus. There are two models available, and they are both 54" Long, and 45" High. The 1154U is 35" Wide, vs. 37" for the SL54DD. NOTE: Clicking on either image will take you to the relevant product. 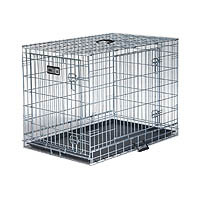 The 1154U Big Dog Crate is a drop pin crate suitable for Great Danes and other dogs 110lbs+. 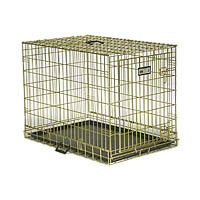 The SL54DD Crate is a two door drop pin crate suitable for Great Danes and other dogs 110lbs+. We stock a full range of replacement pans (also called “trays”) for the older model crates. The Midwest Model 89Z is now discontinued, and was a very sturdy, galvanized finsh 48" drop pin crate. The Model 5 Pan is designed to fit Midwest 48" drop pin crates. The Midwest Model 89Z was redesigned in the early nineties and this redesign increased the width of the crate. Models prior top this date will not accept the Model 5 Pan since the crate is too narrow. You should measure the width of the existing pan, and if it is 27" or less, then the Model 5 Pan will not fit. These older 89Z crates are approximately 27½" wide. MidwestPetProducts.com is now selling Dog Crate Covers in five sizes (24 - 48") and four colors - Blue Denim, Burgundy, Hunter Green and Khaki. Due to a dramatic increase in wholesale, manufacturing and shipping costs, we have reluctantly raised our prices on the 1154U and Life Stages single and double door crates. We have maintained constant prices for one year on these products, but are unable to do so any longer. We hear some "experts" out there advising you to buy a succession of crates for your dog as it grows from puppy to adult. The idea is that you get a crate just for the size of the dog as it grows. They claim that this is necessary to prevent your dog from having enough room to sleep at one end of the crate and eliminate at the other end. So they want you to buy a whole bunch of dog crates. The divider panel as shown with the "puppy" (above left) reduces the size of the crate when he/she is small. The divider panel can adjusted until your dog reaches its full-grown adult size in about 12 - 18 months. So - one crate works for the puppy and the dog, which is why the divider panel saves you money. Conclusion: The divider panel allows you to buy the crate for the adult size of your dog, yet still allow it to be suitable for a puppy. This saves you time and money; a great investment! Shipping from the Cincinnati facility has returned to normal - the level 3 emergency has been lifted. Due to the continued level 3 snow emergency, please allow extra time to receive your package. Due to the level 3 snow emergency affecting Cincinnati and the tri-state area, there are no deliveries from our warehouse today. We will ship as much product as possible from the Indiana facility, but please allow extra time to receive your package. Midwest iCrate or Life Stages? What's The Difference? These crates are both folding wire dog crates in size for dogs 11 - 110 lbs that include both a divider panel and the ABS plastic pan. This leads many people to ask: "What's the difference between a Midwest iCrate and Life Stages dog crate?" Specified (by the manufacturer) as "Medium Strength"
It really depends on your budget and preference. If you are price sensistive, or want a lighter product, then the iCrate is for you. If you prefer a stronger product and don't mind the extra weight, or spending a little more money, the Life Stages is for you. What is a Dog Crate? Which Size Quiet Time Bed Should I Get For My Crate? The Life Stages Ultima Dog Crate is no longer available and has been replaced by the Midwest Ultima Pro 700 Series Triple Door Folding Dog Crate. The Ultima Pro 700 Series is not manufactured in the USA. How often do you hear the phrase "Made in USA" anymore? We are pleased to offer you the Midwest Life Stages Ultima Triple Door Dog Crate. This is a heavy duty crate with three doors in a bright zinc finsh and best of all - it is made in Indiana! This crate is the ultimate in versatility, hence the name "Ultima". Three doors provide multiple ways to access your crate. One end door hinges on the left, the other on the right and there is a side door. The crate is equally at home in the room, between two pieces of furniture or in the back of your SUV or wagon. The Ultima dog crate includes a free divider panel. This allows you to adjust the size of the crate as your dog grows from puppy to adult. The ABS pan is included and makes it easy to clean up after your pet. This is the only crate you'll ever need! The crate folds easily and includes carrying handles so you can move it from house to vehicle in seconds. If you are looking for a great looking, well made dog crate that just happens to be Made in the USA the Life Stages Ultima is the ideal crate for you and your dog. We hear some "experts" out there advising you to buy a succession of crates for your dog as it grows from puppy to adult. The idea is that you get a crate just for the size of the dog as it grows. The claim is that this is necessary to prevent your dog from having enough room to sleep at one end of the crate and eliminate at the other end. The divider panel as shown with the "puppy" above is to use the divider panel to reduce the size of the crate when he/she is small. The divider panel can adjusted until your dog reaches its full-grown adult size in about 12 - 18 months. We are experiencing an increased number of incidents of pans breaking in transit due to the cold weather. If your pan is damaged in transit, please contact us. For those with big dogs, 110 lbs+, we now sell an addition giant dog crate. 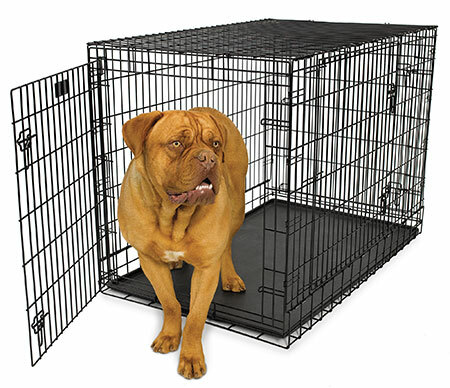 The Midwest SL54DD Solutions Series Crate is a giant two door dog crate for colossal breed dogs such as Great Dane, Saint Bernard and Mastiff. We offer a range of folding extra large dog crates that can be confusing to some people. Although they all fold, the differences are in the strength, finish, number of doors and the country of manufacture. They are made in China with the exception of the Life Stages Ultima LS-1648UL. You can find all of our extra large dog crates on this page: Extra Large Folding Crates. Yeah, we love big dogs too! There's something great about giving fido a squeeze and having to put your arms all round him for a hug! With the additional door on the side, you have more flexibility in how you place the crate. Maybe you want to put the crate flat against the wall in the corner of the room. Perhaps you want to squeeze it between two pieces of furniture. Whatever your reasons, the two door giant dog crate offers flexibility for you, your home and your pet. So Why the Price Difference for an Extra Door? There are some differences between the two giant crates. The Solutions Two Door crate is an extra two inches wider, includes the pan, and has an extra door on the side. The additional weight and size means that the package is much more expensive to ship than the regular 1154U Giant Dog Crate. Click on the picture below to take you to the product information page for the Midwest Solutions 'Ginormus' Double Door Dog Crate. We will begin selling a full range of dog crate covers and adding to our vehicle pet barriers. Currently scheduled for February 16th, 2009. There is no doubt that people love the Canine Camper and Day Tripper Soft Dog Crates. These crates are particularly suitable for the pet owner who travels frequently with their dog and needs a lightweight crate to contain their pet. Although they are versatile and great quality products, they are suitable for crate trained dogs only since "chewers" (we know who you are!) can damage the fabric. It is no wonder that these crates are used so much by professionals. Click on the picture below to take you to the product information page for each model. At MidwestPetProducts.com we take pride in providing indoor containment products for your pet. So, what to do to keep Fido in the yard? Announcing our latest site: MuttFence.com. Same great service: FREE shipping with 90% of our products shipping same or next day! Get a dog fence from MuttFence.com. FREE shipping on wireless, electric and underground pet fences from Innotek and PetSafe. Receiver collars ship FREE 2nd day air! Same great service - in stock and ships same or next day. Now Selling Midwest K9 Kennels! We now offer Midwest K9 Kennels for online sale. These products are versatile and secure and set up in just 30 minutes requiring only a pliers. Strong, rust-resistant galvanized steel construction with safety rounded corners and a secure latch mechanism make these chain link dog kennels a great solution for you and your pet. The Midwest K9 Kennel is perfect for your outdoor containment needs! The doors are removable without tools, but only when fully open. This feature stops the doors from being removed while the dog is in the crate. Removable doors offer a great advantage for a dog that is full crate trained. Most dogs that are correctly crate trained willingly go to their crate since it offers a safe and secure place for the dog like their den in the wild. For the dog owner, it allows the best of both worlds: you can securely keep your pet in their crate when needed and at other times the dog can come and go as he/she pleases. We think you will find the Midwest Select Dog Crate offers a unique and versatile solution for your pet containment needs. Exercise pens have increased an average of 8%. Dog crates have stayed constant. We have added a $5.95 transit surcharge per order for orders to sent to CO, MT, NM, NV and WY, and a $9.95 surcharge on orders sent to AZ, CA, ID, OR, UT and WA. Replacement pans have been reduced in price by 5%. Many people think that crate training is cruel, and is like incarceration. The truth is that crate training can help your dog be happy and content, or it can be a source of great distress and that depends on you, the dog owner and how you approach the task. Now, before we continue we have to tell you that we are not trained behaviorists and that you should seek advice from a trained professional. So, Is Crate training Cruel? In the wild, dogs will seek shelter in a secluded and safe place. Their life may depend on this. A safe and sheltered location will have a restricted entrance that is easily defended by the dog. In the wild we call this a den and in your home it is the dog crate. It is natural for your dog to seek shelter in this way. If you do not provide a safe place for your dog, he will likely try to adopt a spot in the home that most closely matches the conditions he would find in the wild. She'll curl up in the corner, under a chair or table, desparate to find a safe place to snuggle up. Chances are that this won't be where you want your dog to stay. A Midwest Dog Crate will be like home and properly used will be that den that your dog is looking for. Instinctively dogs will not eliminate in their den, so this aids housebreaking. As another bonus, your crate will keep your pet from using your furniture as a chew toy! Don't tolerate aggressive defensive behavior from your dog - some dogs can be "cage guarders"
So that's it. A Midwest Dog Crate could be the best thing you do for your dog and your home. We get plenty of questions about Midwest iCrates. What are they, and how do they fit in to the product range? 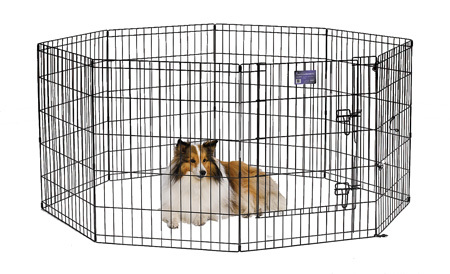 Midwest iCrates are very similar to the Life Stages Single Door and Double Door dog crates. Just like the Life Stages crate, they are come in sizes for dogs from 11 - 110 lbs. They also fold up without tools for easy carrying and come in single door or two door formats. Again like the Life Stages, the manufacturer specifies the iCrate as a medium duty crate. So, What Makes An iCrate An iCrate? There are two main differences between an iCrate and a Life Stages crate. Firstly, the bars of the crate are a little further apart than the on the Life Stages crate. Secondly, the crate is a fraction smaller in width and height. Although the manufacturer specifies the iCrate as a medium duty crate, we sell it as a lighter duty crate than the Life Stages. The reduced amount of metal and welds in the crate construction allow it to be offered at a lower price. The iCrate is ideal for the price conscious dog owner and a great solution whether you opt for a Midwest Single Door iCrate, or a Two Door iCrate. The attractive black finish, quality construction and fold and carry finish make the iCrate a great addition to the Midwest Dog Crate lineup. It's all go here at MidwestPetProducts.com with some great new products arriving in February. The Canine Camper products are being revamped, along with the Vehicle Barriers. First the bad news: we no longer sell the Canine Camper. Now the good news - it has been replaced with the Two Door Canine Camper and the price is exactly the same. Now you get two door versatility for the same great price as the single door Canine Camper. We couldn't leave you without a single door Canine Camper, so we are proud to announce the Canine Camper Day Tripper. This pop-up tent crate has all the features you love in the Canine Camper and comes with an attractive tan finish. Even better news is that they are little less expensive than the old Canine Camper model. We know how much fun it is driving around with your dog. We have a couple of dogs that like nothing more than to go for a truck ride. Up the street, around the corner or on a road trip - they don't care as long they're on board. We know that safety for you and your pets is your top priority, so we offer Vehicle Barriers to keep your pets in place in your vehicle while you travel. Annnouncing the Midwest Vehicle Barrier 13N. The 13N has all the fetures of the 14N and 15N, but can be as small as the 14N or as big as the 15N meaning it truly is a one size fits all barrier. So, whether you have a Chevrolet Tahoe, or a Subaru Forrester, you'll find the Midwest 13N a great solution for you. Life Stages, DD & UL - What's The Difference? We get plenty of questions about the difference between the three types of Midwest Life Stages dog crates. Let's start by listing the three different models. The Life Stages and Life Stages DD are very similar in that they are both medium duty folding crates with a black, electro-coat finish. The primary difference is that the Life Stages crate has a door on one end and the Life Stages DD crate has an additional door on the side. The extra door provides a great deal of flexibility in crate placement. The crate can be place sideways between two pieces of furniture and the side door can be used as the primary door to the crate, or the crate can be placed in the back of your SUV to keep your dog safe while traveling. The Life Stages Ultima is a heavy duty three door dog crate and it comes in a handsome silver galvanized finish. It offers you the ultimate in flexibility and safety for your dog. There is no doubt that both owners and dogs love their Midwest Dog Crates. These crates are well made, well designed and last a for very long time. Among all the positive feedback we get, we do get one complaint; the pans. Midwest Replacement Pans are made from ABS plastic. They are tough, durable, and under most circumstances they will last a lifetime. However, some owners report persistent problems with the pans breaking while others state that they last forever. We decided to do some research and find out what is happening. The Midwest Dog Crate Pan sits on top of the wire bottom of the crate. If your dog is active in the crate, is heavy, or just stands up a lot it, causes flexing between the ABS plastic and the wire bars of the crate bottom. Over time (and with some dogs that is not long) the constant flexing can cause the pan to break. We recommend putting some cushioning between the pan and the crate to reduce this flexing. Suitable materials may include plywood or cardboard, but in our experience the best material for this purpose is carpet. If you have some left over carpet, you can use this, but even if you do not, you can purchase remnant material from a home improvement store very inexpensively. Home improvement stores cut sections of carpet to length for customers, and often what is left of the roll is not big enough for regular resale. These pieces become remnants and are sold at a discount. We recommend a thicker piece of carpet for this purpose. Simply measure the size of the pan and ask for your local store to cut you a piece the same size. To install, simply remove your Midwest Dog Crate Pan and place the cut piece of carpet on the base of the crate. Next, replace your pan and use your crate as normal. We hope you have found these tips useful and they lead to extended pan life for your Midwest Dog Crate. If you are in need of a replacement pan, please visit the Midwest Replacement Pans page. What's so special about three door dog crates? The two models available are the Select 1300TD, and the Life Stages Ultima. The Select 1300TD is available in 24 - 48 inch size for dogs 25 - 110 lbs, and the Life Stages Ultima is available in 30 - 40 inch size for dogs 40 - 110 lbs. These crates offer the dog owner the ultimate in flexibility. Because each crate has a door on each end and one on the side, they allow versatility in crate placement. These crates are equally useful in the home or in the vehicle (please check dimensions). Because of the extra doors, a divider panel can be fitted in the middle and the crate can be used for two dogs - remember to size the crate appropriately for this application. The primary difference between the two crates is in the finish and how the doors are constructed. The Life Stages Ultima offers a bright zinc finish, and the Select 1300TD offers a pewter fleck finish. In addition, the doors of the Select 1300TD can be removed without tools. This is particularly useful where space is limited, or if the crate is used as a sleeping place for your dog, but you want the animal to be free to move about otherwise. We think you'll agree that a Midwest Three Door Folding Dog Crate offers the ultimate in convenience, durability and flexibility. In addition, our three door crates are on sale when you purchase the crate along with a Quiet Time Bed. Don't tell anyone - that offer is just for readers of this blog! The discount is applied at chekout time. Hurry, because this offer is combined with free shipping and is available for a limited time only.